Premier League club Arsenal plan to offer new five year contract to full-back Hector Bellerin, according to Daily Mail. The Spaniard has been linked with Barcelona. 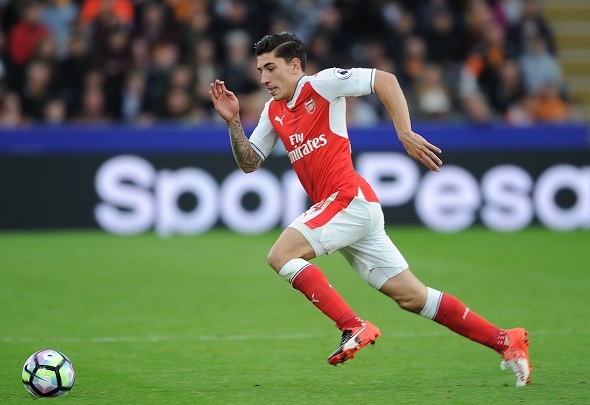 Arsenal are planning to offer a new five-year deal to full-back Hector Bellerin, according to Daily Mail. The latest reports have revealed that the Gunners representatives are preparing a new long term contract for Bellerin who has been eyed by Spanish giants Barcelona. It was reported by Football News Guru few weeks ago that Barcelona are preparing a £40 million bid for their former youngster. Furthermore, Bellerin was expected to follow Cesc Fabregas footsteps but with the latest news these rumours can finally be ended. Premier League leaders Manchester City have also been interested in his transfer. The negotiation between the player and the club has started and the player is likely to seal a new deal in the next few weeks. The Spaniard who has made three appearances for Spain is currently preparing for the international break and will resume his focus on the club next week. The 21-year-old who is currently the best right-back in the Premier League has still left three years on his current contract at the Emirates Stadium. Bellerin has been a vital player for Arsenal since last year, he has made 80 appearances for the North London side in all campaigns.